Hi! I'm a biker from Eindhoven, Holland. 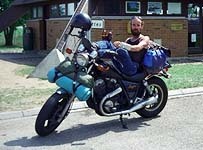 This is a picture of me on my 1983 Honda Shadow VT 750 C. The photo was shot 96 by a little French boy on my way to the 'Free Wheels bike Show' in Cunlhat, France. That's a great bikermeeting where around 25.000 bikers have tons of fun !! Unfortunately I can't go there this year because I planned a trip to Vancouver, Canada. You can't have it all!! If anyone of you bikers is in the neighbourhood of Eindhoven (Holland), visit the 'Thunder Roadhouse Cafe', the best biker bar in Holland !! Hi...Glenn Hallerman from Marietta, Georgia (USA) on my 84 Shadow with my nextdoor neighbor. This is my '85 Shadow. I started riding in '94 when I wanted a ride on someone's bike and I couldn't find anyone with a bike. I decided to not wait and took the Honda Riders Association course and PASSED (on the 2nd try)! THEN the DMV actually gave me my license and the rest is history. I've only fallen twice and took someone with me once (see dent on Shadoryder's bike). Bob told me that he already told you I ride an 86 Shadow 700. I just started riding in August of 95. Then in Sept I broke my knee cap and had 2 surgeries and couldn't ride for 6 months. When I started in April of 96, I didn't have anyone to ride with, so I put out flyers and by August 96 there was the beginningof the Shadow Club as it grew, Bob Hidley found the national club on your web pages and it has grown and is growing more every month. EQMC "Ebony Queens Motorcycle Club"
Here is a picture of one of our Ebony Queens (Foxfire) on her Honda Shadow. What do you think? I sure have enjoyed looking at all the Shadows in your pages (for almost a year now) and thought maybe it was high-time to include a pic of myself and my '86 Shadow. So here she is. This pic was taken on the way to the '10th Annual Sun Run Picnic' in '96, at the head-waters of the Salmon River in south-central Idaho (a trip I make 10-20 times every summer since it's just north of my home in Hailey). I've customized the bike a little since I bought it from the original owner in Aug of '94. I got it with only had 8,500 miles on it and since then I've put a little over 9,300 on it, all without a single problem! I'm on the second pair of after-market pipes (the first set just didn't have the sound I was looking for), Willie & Max Saddlebags / Tool Bag and a good Windscreen (a "must" for long highway rides!). Hi there, my name is Mike Dawdy. I live in London, Ontario, Canada. My bike is a 1985 Honda Shadow VT750C. You may note from the picture that almost the entire bike is in chrome. The following are parts that I believe are not chrome on a standard bike, but are on this one: front and rear fenders, tool box cover, body side panels, fuel tank, fuel pump cover, clutch and transmission covers, hydraulic fluid container covers, brake caliper covers, headlight visor, radiator cover, and the brake and clutch levers. It also has a chrome fixture on the tail-light that does not show too well in the picture. It also has chrome wheels! Pretty cool, eh? I bought the bike in July of 1994. It already had all that chrome on it. What a find! I have seen two other shadows of this vintage with extra chrome parts, especially the fuel tank, but this is the only one that I have seen with this much chrome. In the spring of 1996 I took a motorcycle maintenance course at Fanshawe College. So, I was able to service all of the following myself: spark plugs, oil, oil filter, fuel filter, air filter, fork oil, fork air pressure, front brake pads, battery, final drive oil, brake and clutch hydraulic fluid, and engine coolant. Also did a compression test and idle speed adjustment. It helps to have the Clymer manual and an original owners manual. The latter I bought at the Toronto bike show in 1995. If you havn't cleaned your air filter do it now. You will immedialely notice a big increase in performance. It is the single most important tune-up item! What a great ride! This vehicle is a rocket ship from 5000 RPM to the red line. It is very solid on the highway - wind does not bother it. For this it helps to change the fork oil and install 6 psi of air in each fork. But read the Clymer manual before doing this yourself.